Although Yilan has a limited selection of restaurants, the county makes up for it with its night markets. 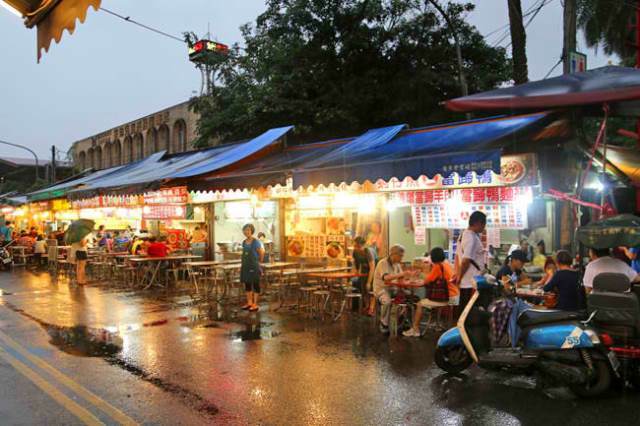 Yilan locals usually eat at home but the Yilan Night Market and the Loudong Night Market are good bets for a decent meal especially for the hungry traveler. Compared to the Kaohsiung and Taipei market, the Yilan Night market is not as big in size but provides a considerable good array of munchies to excite the palate. The Yilan Night Market is located in the heart of the city and is known for a couple of local specialties that are worth the try. This smaller and low-key market indeed has the food and atmosphere typical of Taiwanese night markets. See tons of stinky tofu, chicken posteriors on a stick, ducks, seaweed-favored shawarma, sweating cooks stirring huge amounts of food and happy crowds munching the night away. As long as you’ve been to a night market in Taiwan, the Yilan Night Market should be of the same. Although most of the food at the Yilan Night Market can be found in any other night market in Taipei, there are two food items that are definite must-try’s: scallion pancakes and a drink called ‘yaoyaobing’. Scallion pancakes should not be tried at just any stall but the food stand that has a Hello Kitty sign on it. These pancakes are indeed thicker and tastier, making them quite famous in Yilan. On the other hand, the yaoyaobing drink used to be extremely common all over Taiwan but is now almost unheard of in some cities. However, this old-fashioned drink is very much alive in Yilan with its mixture of fruit juice, lush ice and other exotic flavors. Now if you’re looking for a bigger and more extreme night market experience, the Luodong Night Market is definitely a must-visit place. This market is quite famous and is often very crowded with people. Add to the equation the narrow streets of the area, expect the place to be dense and extremely congested making it sometimes impossible to move. Popular signature snacks of the night market include rice noodle thick soup, iced tapiocas with red beans and mutton herbal soup which always has a long line of people just waiting to get a taste of this delicacy. Other munchies include ox-tongue shaped pastry and smoked duckling. Not only is there a huge selection of food items to choose from but the usual night market items such as clothes, accessories and bits and pieces of random stuff are sold here as well. Of the many night markets in the Yilan County, the Luodong Night Market has some of the longest lines. Although standing in queue can leave you quite restless, you’ll but be sure that what you’re lining up for is worth the wait evident with the stall’s long lines of local customers. They say that in order to get a piece of the local culture and way of life of a city, the best place to visit is the city’s markets and these two markets do not disappoint. As the rest of the Yilan County closes down after dark, the Yilan Night Market and the Luodong Night Market start to come to life.